Brief Synopsis – A businessman on the brink of losing his business tries to reassess his whole life both professionally and personally. 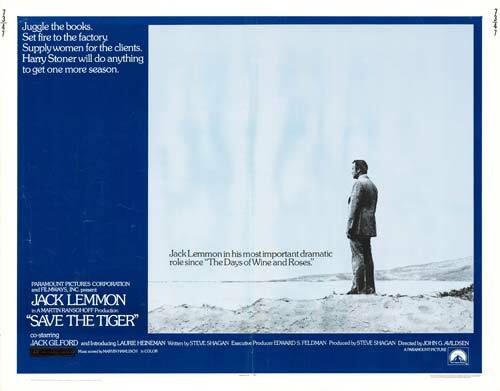 My Take on it – Jack Lemmon was always an excellent actor, but he usually did a much better job in comedic roles than in harsh dramas. He is truly amazing here in a role about a businessman at the crossroads of life and despite it’s grim outlook on the world, his performance is the one that got him his Lead actor Oscar. With this win, he actually became the first actor to ever get both a lead and supporting actor. Watching him in this movie, I can understand how he could manage numerous other dramatic roles in other films I’ve seen him in because he truly was such an amazing actor. The plot itself isn’t perfect and it’s a bit too dark for what I usually like, but it seemed to work well most of the time. Bottom Line – Lemmon is excellent here and with this Oscar win became the first actor to ever win both a supporting and lead Oscar. The storyline is grim and eventhough he is known for usually excelling in more upbeat roles, he really hit it out of the park here. Recommended!